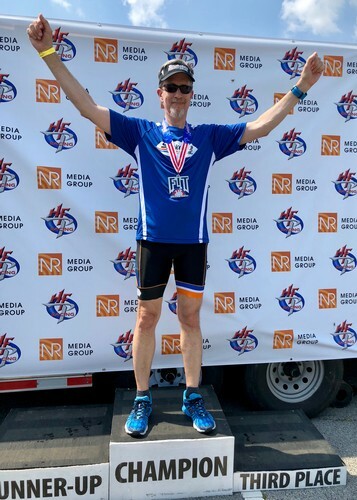 June 17, 2018 - The hottest Duathlon I have ever done. There is not one place on this course that has any shade. A beautiful sunny and HOT start to a really fast and flat course. I had a good start in the front quarter of the pack and just ran my race from there. Knowing the temps were going to continue to climb I held back some effort, and would save it for the bike portion. The bike course was well marked and the cross streets were well marshalled. Again NO shade, and the heat was building! Felt good coming off the bike, and hit the final run at a fairly good pace. My splits were a bit off, but the Full Sun and the nearly 90 degree heat was breaking people down on this final run. When I was less than quarter mile from the finish, I still had some engery in the tank, so I sprinited away! So this was a good thing, as I found out the one of the guys I passed were in my age group. Bam, First Place for me! !